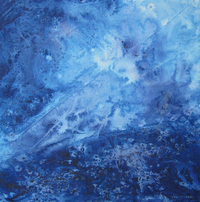 Abstract painting on handmade paper, inspired by the colours and textures of the Indian Ocean. One of a pair (see Ariel's View 2).Is it a seascape or is it a view from above?? Unframed, in an offwhite mount, the size of which is 53x39cm. Could be framed in either portrait or landscape format.